Do you like Death by Ninja? Share it with your friends. 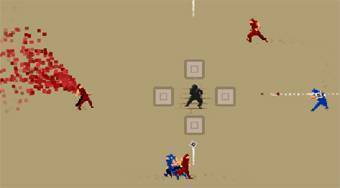 Death by Ninja is a very catchy, brutal game that perfectly checks your perception and quick response. Your mission in the game will be to control the fearless ninja warrior whose task is to survive as long as enemy attacks in the arena. Kill the enemy with attacking enemies from all sides, reflect shurkens and try to stay alive for as long as possible.